In order to make my DeArmond Ashbory bass balance better, I moved one of the strap buttons to a spot near the output jack. 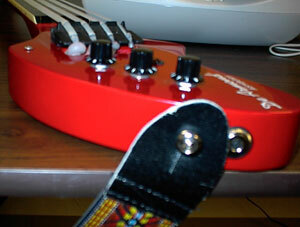 The other end of the strap is connected (by a quick release mechanism made by D'Addario) to the headstock. I put screws in the holes where I removed the old strap buttons. Figure 1: The strap button from the front of the body was moved to the end of the body above the 1/4 inch input jack. 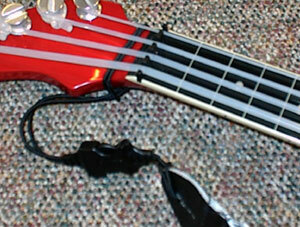 A screw was inserted in the body where the strap lock used to be to preserve a cleaner appearance. Figure 2: Relocated strap button with the strap attached. 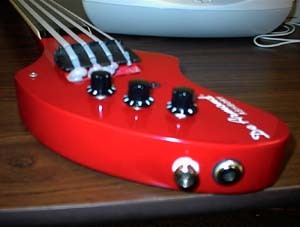 Figure 3: D'Addario Acoustic Guitar Strap Quick-Release System in place around the headstock with the fastener snapped together. 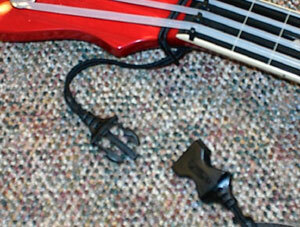 Figure 4: D'Addario Acoustic Guitar Strap Quick-Release System unfastened. Figure 5: Here's the whole thing together. Click on the image for a larger view. Copyright © 1998-2014 Brock A. Frazier. Not responsible for typographical errors or misinformation. How 'bout that?! 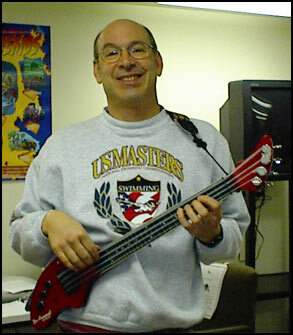 Contributed comments and content not necessarily the viewpoint of that Ashbory Bass resource named "Large Sound"